I've always been fairly relaxed about my skincare routine and have never really suffered from any major problems but, as the realisation that I was about to turn 36 hit me this time last year, I thought it was time to start taking a bit more care of myself. All those sleepless nights over the past eight years had definitely started to take their toll, and there was no harm in investing a bit of time and interest in looking after my skin. 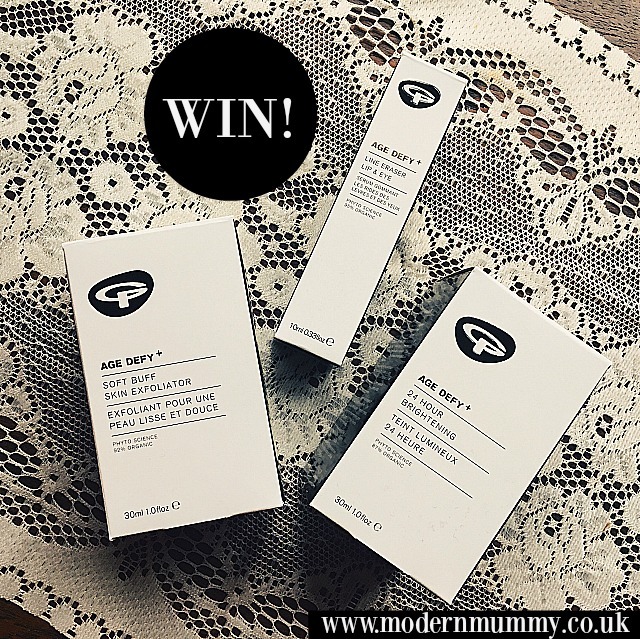 For the last year I've used Green People's Fruit Scrub and Vita Min Fix 24hour Moisturiser and have absolutely loved them both - I've even given up wearing foundation altogether since I started using them which has been amazing. They were recommended to me by some of the mums from school and I am now a massive fan of Green People's natural, organic skin care range. Not only are their products 90% natural and organic, they are also 100% vegetarian and cruelty-free. They may come in smaller pots than we are used to buying but they last forever! Just earlier this year I found out that this is because Green People don't bulk out or dilute their products - there's no added water and no nasties in there whatsoever which means a little really does go a long way. So with the arrival of some new laughter lines, and the offer of a few samples from the lovely Green People people, I have now upgraded to the Age Defy+ Soft Buff Skin Exfoliator (£20 for 30ml) and the Age Defy+ 24hour Brightening Moisturiser (£36 for 30ml), with a little bit of Age Defy+ Lip and Eye Line Eraser, (£20 for 10ml) thrown in for good measure! The Age Defy+ range is aimed at women over 35 and contains entirely natural ingredients to assist with the regeneration and hydration of the skin. As we get older, blood circulation slows down and our skin cells receive less oxygen which means our complexions suffer a little. Exfoliation is a quick and easy way to get rid of old, damaged skin cells and has been part of my skincare regime for as long as I can remember. The Soft Buff Skin Exfoliator uses pineapple extract, bamboo stems and bentonite clay to unblock pores and gently remove these unwanted cells. The 24hour Brightening Moisturiser is super hydrating which makes the skin look plumper and smoother (and younger! ), reduces hyperpigmentation (age spots to you and me) and reduces fine lines and wrinkles by stimulating cellular metabolism. Basically it's a wonder cream! I've talked about laughter lines already but I have also developed the beginning of crows feet over the last year. Obviously this is because I'm so fun and happy and have smiley eyes ;) and I don't really mind them, but I thought I'd give the Line Eraser a go, more as a preventative than anything, and also to see it's effect on my very prominent eye bags! It definitely works in both ways - it firms the skin and definitely reduces dark circles (although I'm not sure it is supposed to). I'll keep you posted on the development of my crows feet, but at the moment it seems to be keeping them at bay. As with all Green People products, they are seriously nice to apply and smell so, so good (although they also have a scent-free range if you have super sensitive skin). All in all, in just a couple of weeks, my skin feels much smoother and brighter and I will definitely be making the switch to the Age Defy+ range for future purchases. And if you'd like to try them yourself then I have a set of all three of these products up for grabs for one lucky reader! Entry is via the Rafflecopter widget below, and everyone is entitled to six entries each. The giveaway closes at midnight on 8th February 2017 and the winner will be announced and contacted shortly afterwards. This giveaway is open to UK Residents only and the prize will be sent direct from Green People.